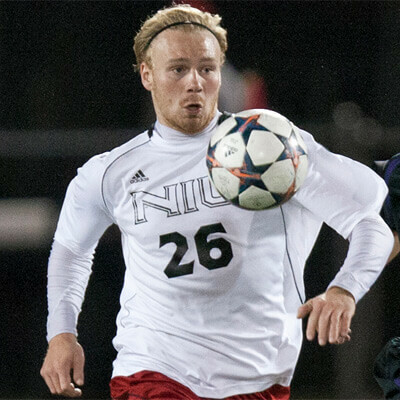 Senior Isaac Kannah (Plymouth, Minn./Prairie Seeds Academy) scored his fourth goal of the season Saturday night, but the NIU men’s soccer team fell 2-1 to Buffalo at UB Stadium. The Huskies finished the contest with nine players after receiving red cards in the 61st and 71st minutes. 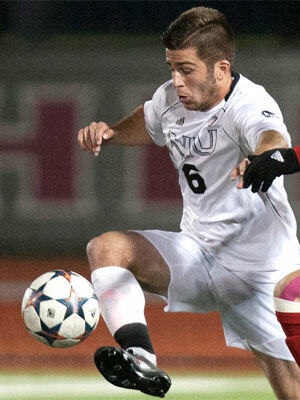 “I don’t want to take anything away from Buffalo, they scored two very good goals and were ahead in the game when it was 11-v-11,” said NIU head coach Eric Luzzi. “They earned those goals and I thought they played a very good game, they were deserving of the three points. 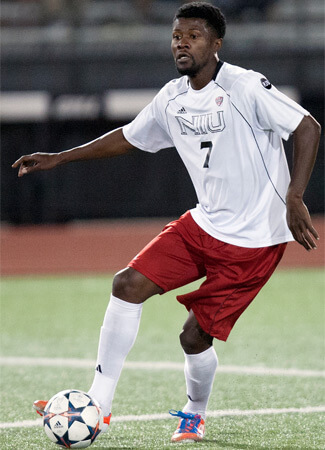 In the 16th minute, NIU won a pair of corners and senior Dusty Page (Germantown, Wis./Kettle Moraine Lutheran) rose highest to the second corner by sophomore Albert Levett (Southend-on-Sea, England/Belfairs High), but his header went high. The Huskies created another chance in the 20th minute off a corner kick. The corner went deep to freshman Len Heinson (Wuppertal, Germany/Carl-Fuhlrott Gymnasium) and the second ball came to sophomore Cody Witkowski (Batavia, Ill./Batavia) near the top of the box who whistled a shot high from 20 yards. NIU had its best chance of the first 45 in the 34th minute as senior Andrew Palumbo (Ft. Myers, Fla./Bishop Verot/Darton College) earned the Huskies a free kick from just outside the edge of the box. Heinson took the free kick for the Huskies and clipped it off the top of the crossbar and out for a goal kick. Junior goalkeeper Andrew Glaeser (Walla Walla, Wash./Walla Walla) was called into action for the first time in the 38th minute as Nicolai Berry took a shot from distance that Glaeser tipped around the post for a corner. On the resulting corner kick, Glaeser made another save off a shot from Berry. Three minutes later, Buffalo opened the scoring on a blast from distance by Russell Cicerone. Cicerone found himself in space outside the box and fired a rising shot into the top corner past a diving Glaeser. At halftime, the contest was delayed by an additional 20 minutes due to lightning. Following the extended intermission, NIU had the first chance as Palumbo did well down the wing and crossed to Witkowski, whose shot went wide in the 50th minute. Buffalo doubled its advantage in the 54th minute. Marcus Hanson and found Cicerone who created just enough space to get off a shot. Glaeser got a hand to the shot that was headed for the top corner at the back post but it wasn’t enough to keep it out of the net as Buffalo took a 2-0 lead. Three minutes later Hanson had a chance for Buffalo after Cicerone did well down the line and crossed back to Hanson, but he fired his shot well high. In the 60th minute, Kannah pulled a goal back for the Huskies. Heinson fed a ball to the Huskie senior on the right inside the box and he powered a shot past Waleed Cassis at the near post to cut the Buffalo lead to 2-1. Just over a minute later, Kannah was shown a red card and the Huskies were reduced to 10 men. Down a man, Heinson had an opportunity from well out in the 63rd minute that was held by Cassis. Glaeser kept the Huskies in the match with a 70th minute save on Cicerone. A cross came to the Buffalo striker near the penalty spot and his first time shot was saved by a diving Glaeser. A minute later, the Huskies were down to nine men after Witkowski was shown a red card. Despite playing down two men, the Huskies continued to push forward for an equalizer, having the better of the play. Palumbo had a pair of chances, forcing saves from Cassis in the 73rd and 76th minutes. With plenty of space available for Buffalo going forward, Glaeser made a trio of excellent saves with just over 10 minutes to play, keeping NIU’s chances of a comeback alive. But the Huskies were unable to find an equalizing goal. Glaeser finished with seven saves in the contest. NIU returns home next Saturday, Nov. 1, as the Huskies host Akron. Game time against the Zips is scheduled for 7 p.m. For more information on NIU men’s soccer and Huskie athletics, visit www.niuhuskies.com.